Spring and summer! Well, for a couple of days anyway. Our weather will turn cold again this weekend, dipping below freezing. Which means most of the flowers currently blooming will die. It seems that it is always this way before spring finally stomps through the door! DISCLAIMER: I am not responsible for your binge-eating while reading this post. I've already had to stop once to lick the ice cream off the keyboard. I do not want this to happen to you! You don't deserve it! With that being said, here is where we begin. Are these not the most adorable things you have ever seen??!! They are Champagne Popsicles. 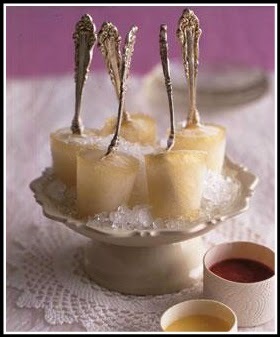 Two of my favorites combined - silver stemware and Popsicle! I do not like champagne but would happily use any other drink (Mt. Dew) to make these. I would give you the recipe. Unfortunately, the site that shared these little gems is written in a language that I cannot read, write or understand. And YES, I know there is Google Translator available, however, I am choosing not to translate so that I can stay away from temptation! I LOVE, LOVE, LOVE these little skewers! They are absolutely adorable and look so appetizing. 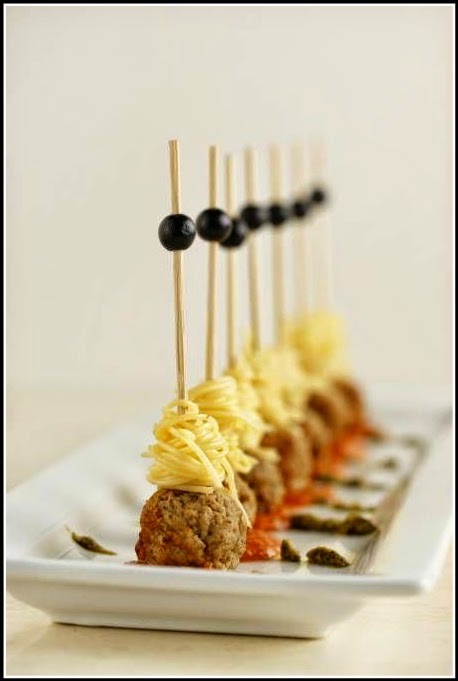 But here are my questions: (1) How long does it take to wrap that pasta around each skewer? (2) How many will I have to eat to get full? Do I get 2 or 20 - because I'm going to need a full plate of these? (3) Can I have a bowl of Marinara sauce? (4) And do I really want to eat it after someone's fingers have been running through the pasta noodles for a few hours? 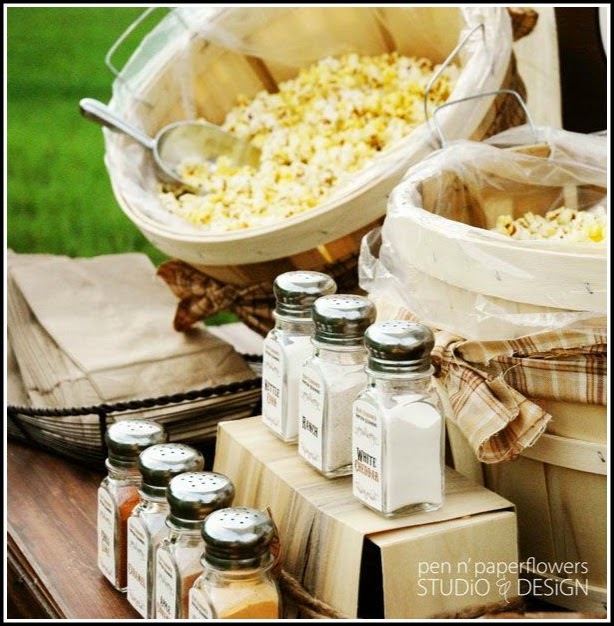 Don't you just love popcorn??!!! This display is really cool, with the apple baskets and brown paper bags. There are so many flavors available now, it's ridiculous! I prefer the salty sweet flavors of Kettle Korn! The hubby likes it with extra butter...lots of extra butter. I don't like butter. It tastes like, well, butter (and red wine tastes like vinegar butter). Needless to say, we have separate tubs when we eat popcorn. And I don't like wine! While all of these eats are wonderful and tasty, this is my killer. The thing that has fifty thousand bazillion carbs and calories....BREAD! I could eat loaves and days of bread dipped in flavored olive oils. 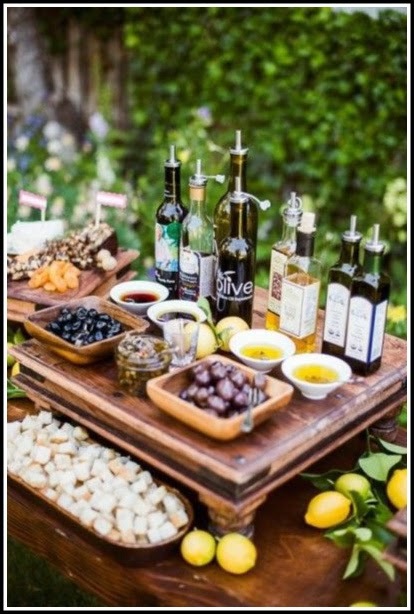 If this were at a party, you would see me stuffing my pockets, purse, shoes and bra with bread and olive oil! I would be carrying the oil around in a brown paper bag like the village wino. But I would be the village oilo! This is also a killer for me. Ice Cream! And more ice cream! 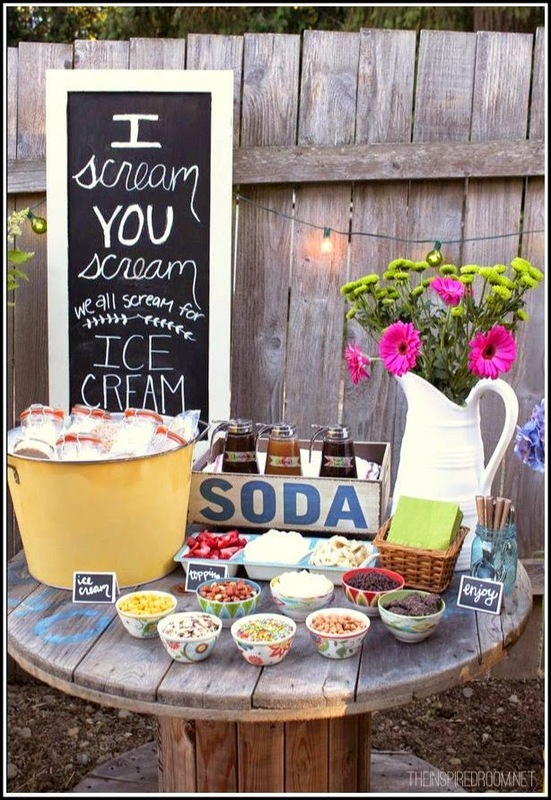 I love this display and thought it was just perfect for a spring or summer party. The little jars that contain the ice cream are so vintage, along with the tub. Needless to say, I love vintage items! A little side story on the ice cream subject. My oldest son, daughter-in-law and granddaughter were visiting over the weekend. I asked Gianna (my granddaughter) if she wanted an ice cream sandwich. She made a face and told me no (she's 5). She said she didn't like ice cream sandwiches. Blasphemy! Everyone loves ice cream sandwiches. I told her she needed to try one before declaring such a thing, so I grabbed one out of the freezer. She took a bite and immediately fell in love, as I knew she would. After a few questions about why she didn't like them at first, we finally determined that she thought I was asking if she wanted an ice cream SANDWICH -- ice cream smeared between two pieces of regular bread! YUCK! I wouldn't want one either! So, can you guess what Pinterest board these are pinned on? You can check it out here. Am I avoiding working on the Stool Pigeon? Yep! Do I love the word LOVE and enjoy using lots of exclamation points? Yep! Now go eat and be happy! Did you just leave out caramel !?! I just stick mine on the FOOD! board. I did leave it out -- it is on the 7 deadly sins board I need to create!! LOL Especially when it is Vanilla Caramel Gelato! I had a bad experience with champagne a few months ago...LOL...really bad! It is still very fresh in my mind, therefore, I've chosen to stay away from that stuff!! Honey, life just gets busy and before we know, time has slipped away! Welcome back! Hugs! !